My family isn’t really into shares. When it comes to shares, their automatic response is: “Investing in shares is like gambling. Don’t do it. It’s a waste of time.” They’ve been burned before, so I can understand why they might be scared. When I ventured outside the family for perspective, I quickly discovered: it wasn’t just my family. A lot of people seem to be scared of shares. Here’s what you have to understand about buying shares: there is a massive difference between trading and investing. Trading is like a one-night stand. Investing is like a long-term relationship. Let me unpack this a bit. In the short-term the price is very unpredictable moment-to-moment, day-to-day. If you bought shares on day 5 (of the example above), it’s hard to say whether you’re going to make a profit or loss over the next few days (or minutes). 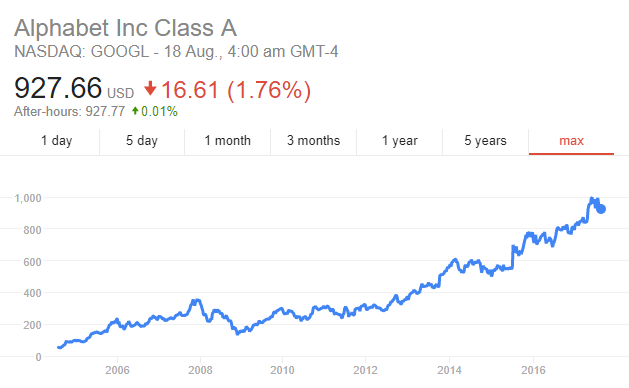 Now, let’s look at the price of Google’s shares since the beginning. Over the longer term, there’s been a very clear upward trend. If you had bought shares in Google back in 2006 and stuck with them, then it wouldn’t matter how many daily dips you experienced, over the long term you would have definitely made a profit. Trading and investing are two different ways to make money in the sharemarket. The major difference between the two is the time period over which someone is looking to make money. Trading is when someone tries to make a profit in the short-term. They’ll pick a share, and then they’re expecting that the price of that share will go up soon (within the next few hours or days), at which point they will sell for a profit. The company might not be a great company, in fact the company might even go bust in a few years but in the short-term, traders take advantage of the movement in the share price and don’t necessarily look at the long-term viability of the company. Investing is when someone is looking to grow their wealth over the longer term. They’ll research a company, and select a company that they think will be profitable/will grow over the next few years. 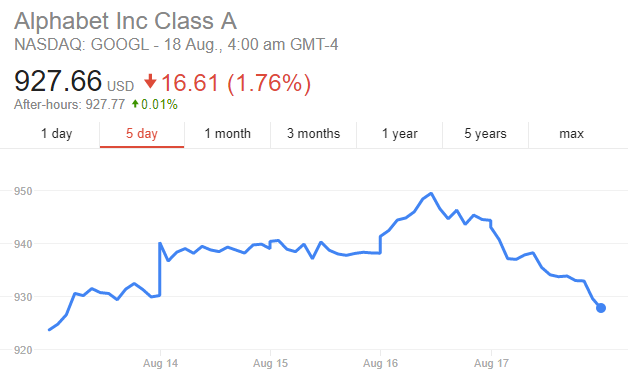 They then buy some shares in that company, which they hang onto for a few years, waiting for the company to grow. It’s like, if I gave you and Bob 5 seeds. You sold your 5 seeds straight away for $1 each and made $5. Bob decided to plant his 5 seeds, which grew into 5 plants that gave him 10 seeds each. He now has 50 seeds. He plants those, and in a few years he’ll have thousands of seeds to sell. You traded your seeds, Bob invested in his. Trading is riskier than investing. Share prices are very volatile in the short term, and they’re often affected by a number of factors other than company performance. Investing is less risky because investors pick companies that they determine are going to do well long-term, not just companies that might have some short-term luck in share price movements. Trading isn’t necessarily a viable option for most people. To be good at trading, you have to spend a lot of time understanding the market, and you have to actively keep an eye on share price movements because you’re trying to “time” your entry or exit to maximise your profit. Honestly, most people aren’t interested in watching share price movements all day. In contrast, you can be a bit more ‘hands-off’ with investing, because it’s about long-term growth of a few great companies instead of the day-to-day short term share price movements. Trading requires you to keep on trading actively to make returns in the short-term. In the example above, if you sold your seeds for $5, then you have to keep buying and selling more seeds to continue making a profit. Most of what you hear about shares relates to people trying to “trade”. 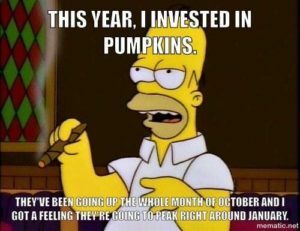 You hear the horror stories of people who’ve lost a lot of money (people who trade often lose a lot of money because they timed the market wrong, or they wrongly predicted the share price movement in the short term). Everyday on the news, you hear about the movements in the market. When you go to parties, you might hear some dude talking about how he made thousands of dollars with some hot company he bought last week. This leads a lot of people to feel like it’s all just a big gamble and it’s way too risky. This creates a lot of anxiety, overwhelm and fear. Like I said, trading is a one-night stand, investing is a long-term relationship. If all we ever heard about was one-night stands, I imagine a lot of people would be too scared to get into relationships! The key is to recognise that trading and investing are not the same thing. Don’t let the fear of trading stop you from investing. We send our subscribers a weekly Money Digest straight to their inbox. You can join in here.